Yellowstone National Park is a testament to the beauty of America's unabated wilderness. The idea of Yellowstone in many ways encapsulates the American landscape, the quest for freedom, and the importance of appreciating nature. Inspired by the vast, untamed expanses and the unique beauty of the West, Yellowstone is an icon for America's unique character. Yellowstone captures the Native American story of our nation-through the stories of peoples that searched for Obsidian to make tools in its lands, performed sacred rites with respect for its mysteries and hunted for Bison. It represents the enormity of the frontier, a land that boomed, as the way of the West influenced popular culture. Even the word captivating falls short to explain Yellowstone's immense beauty. Alpine meadows burst with greenery and yellow flowers, and thermal pots brim vigorously with boiling mud. If there is a trip you should plan this lifetime, this would be it. Our family visited Yellowstone in Late May with our four children. During the Springtime, rivers are brimming with water from the snow melt, causing water to overflow in nearby streams; Nature is awakening from its long winter slumber. Here I will share with you a few things you can explore at Yellowstone, and a few reasons why this is the trip you need to plan. In many ways, the history of Yellowstone is the history of America; it was through this compromise of a National Park that the differing ideas of the East and West collided, but finally worked together for the benefit of all. In 1872, Yellowstone was designated as a National Park, but the path was paved with many difficulties. In the end, the balance between the preservation of nature and respect for the different peoples who lived in the lands adjacent to the park, including respect for the history of Native American peoples in their ancestral lands, and the work of farmers and ranchers had to be balanced to reach the awesome compromise that is Yellowstone. It is the best example of how common ground-the ability to work together as a Nation - even when it is hard, proved to be a gift to the future. The park belongs to us all. Yet, it also reminds us important lessons from the past. 1. Yellowstone's Native American History will inspire you. The history of America's original inhabitants is tied closely to this land. According to NPS, the Great Plains, Great Basin, and Plateau Indian cultures converged in Yellowstone to hunt and engage in other important activities. In addition, the Shoshone or sheep eaters inhabited this area as their culture adapted to the harsh winters (NPS website, 2018). NPS further elaborates on the amazing history of Yellowstone. Before visiting Yellowstone, a great idea would be to see the PBS documentary, "The National Parks: American's Best Idea," a documentary style-series our national parks' rich history and cultural significance. According to PBS in "Yellowstone: America's Scared Wilderness", only 2% of the park has been surveyed for archaeological sites. This PBS article provides some great information about the history of native peoples in the park, such as the use of obsidian to make arrowheads. As you drive through the area, you could explain to children the important uses of this land by Native American cultures. A stop at the Great Teton National Park Site (which I will discuss in a separate blog) would provide additional history for children to learn about the area. Mountain men like Jim Bridger were often met with disbelief when describing the thermal elements and boundless wonder of the area now known as Yellowstone National Park. Dismissed as tall tales, these early stories of Yellowstone can be seen in a different light today as you may find yourself struck by its unbelievably, breath-taking beauty. You can feel nature engulf you as you take in the crisp mountain air, the snow veil melting off lodgepole pines and varieties of sagebrush growing vigorously. The experience of visiting the park engulfs the senses completely. Seeing this untarnished wilderness touches something awe-inspiring, be it magical or spiritual, whatever you choose to call it - Yellowstone is like no other place on earth. 3. You will make lifelong memories. Yellowstone holds a special place in my heart, because it was the first trip we did as a married couple. We stayed in the Old Faithful Inn, which sits right in front of Old Faithful. Several of the rooms in the lodge directly face Old Faithful, and you can see it erupt several times a day. There is also a beautiful restaurant, which features reclaimed wood retrofitted for the beams and support structures throughout the lodge. If it starts to rain at Old Faithful, the lodge is also a perfect spot to walk in for a quick stroll and visit the gift shop. My sister, who also got married in 2004, also visited the park that same year on her honeymoon, and their choice was to camp beneath the stars. The park is different every time you visit. The park is about 2.2 million acres (,8,903 km2) or 34,375 square miles (89,031 km2). Just for reference, Delaware is 1.25 million acres, so you begin to see how vast this park really is when you can not finish seeing everything in several visits. Our most recent trip as a family, began in the Southgate, entering from Jackson Hole and driving through Grand Teton National Park. Due to its enormity, I will talk about our visit to Jackson Hole and the Teton Mountains in a separate blog post. The trip could be very different as you enter from the North. Different weather patterns also influence what you will see. In the Spring, Yellowstone is less crowded. 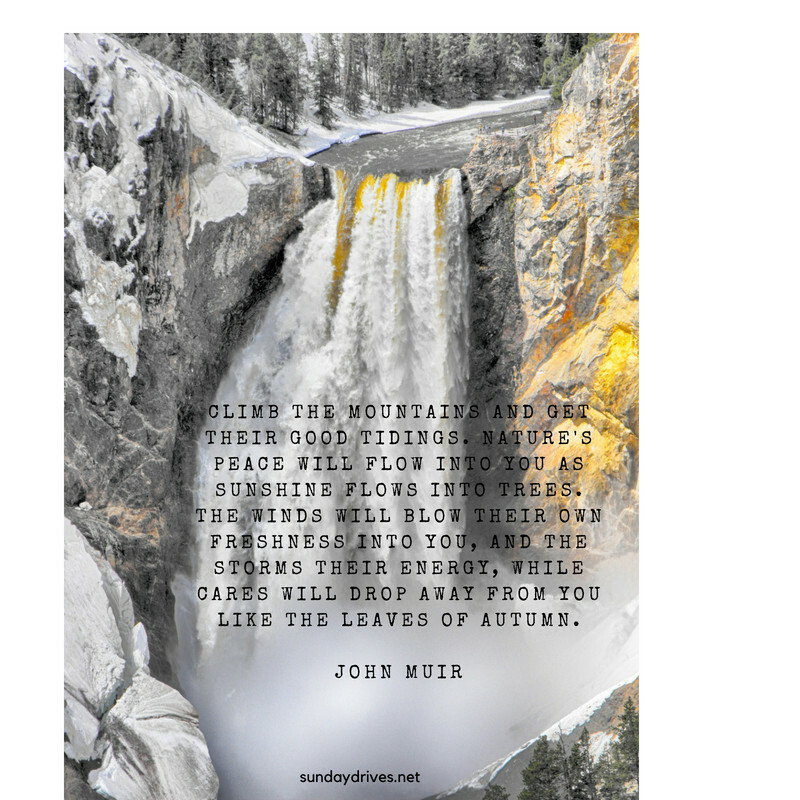 We could still see the snowmelt on the banks of the rivers and waterfalls. The higher elevation provided a crisp, cool air, but it was not too cold. 5.Activities To Suit Diverse Age Levels & Needs. Since we had an infant and toddler in tow, we made several road stops and some shorter walks. The trails we chose were paved and had stroller-friendly walkways like the ones pictured below. We only visited for a day, but you can easily spend a week or more exploring the enormity of the park and surrounding areas on hikes, bike rides, rafting, or doing an array of outdoor sports to cater to any interest. Many local companies specialize in this type of thing, or you can plan it using information from NPS. You could also easily enjoy Yellowstone just as a drive, without even getting out of the car. Our evening drive home was about a 3 hour drive back to the overnight hotel, and we enjoyed every minute of it. Our toddler became a bit concerned about the snow, so we told her Elsa had made it because she was visiting, so she soon found fun in thanking her frozen friend for the beautiful snowfall in Spring. We were quite lucky that the weather was quite pleasant, as spring weather at Yellowstone can be somewhat unpredictable. We had highs of 60's and lows in the upper 40's, but we made sure to pack ponchos and raincoats, which were needed as cold rain started as we watched Old Faithful. 4.Observing Unique Natural Phenomena first-hand. If you love science like me, the science nerd in you will go crazy here. Yellowstone sits on the world's largest super volcano. Just to give an idea of the scope, if this active volcano ever did erupt, the entire continental US would be covered in ash. According to NPS, it is "one of the largest nearly intact temperate ecosystems on earth. . .[and]. . . an important sanctuary for the largest concentration of wildlife in the lower 48 states." (NPS 2018). In addition, important discoveries stem from the biological, chemical, and natural phenomena in the park. For instance, thermal bacteria were discovered here which contribute to the study of genetics (NPS Fountain Paint Pot Trail Guide, May 2017). My kids love learning these things and talking about them in school. There is something to be said about observing natural phenomena first-hand, and this park provides experiences that are unique not just to America, but to the world, as many thermal elements, plants, and biological processes are specifically unique to Yellowstone. You might consider bringing a guide of plants, animals, or geological elements to keep track of as you observe different parts of the park. NPS provides the free ranger program which includes some pages about this topic. One of the best stops for viewing the diversity of Yellowstone's thermal elements is Fountain Paint Pot, located in the lower Geyser Basin. 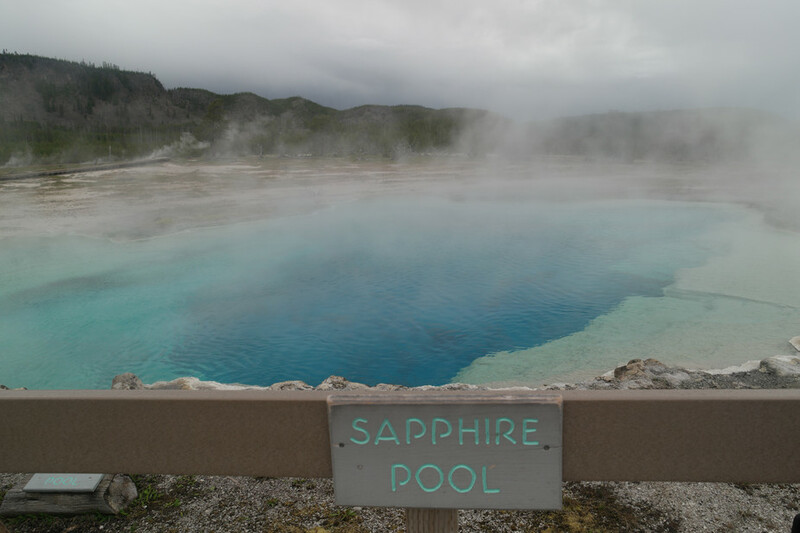 This area contains all four thermal features: geysers, hot springs, fumaroles, and mudpots. In addition, according to the trail guide for this section of the park (which you can purchase for a small donation on the trailhead), Great Fountain Geyser is the only geyser with a summer prediction forecast, besides Old Faithful. Another interesting thing is that this is the spot were thermophilic organisms were discovered that revolutionized DNA processes (NPS Fountain Paint Pot Trail Guide, May 2017). 5.Observing Animals in their Natural Habitat. A benefit of visiting the park in Spring is that animals are rearing their young. A common sight during this time is Mama bears and their cubs born in winter, as well as Bison giving birth to young in Spring (NPS 2018). We were able to catch a clear site of a Bison pictured below at Sunset, a common site at Yellowstone. 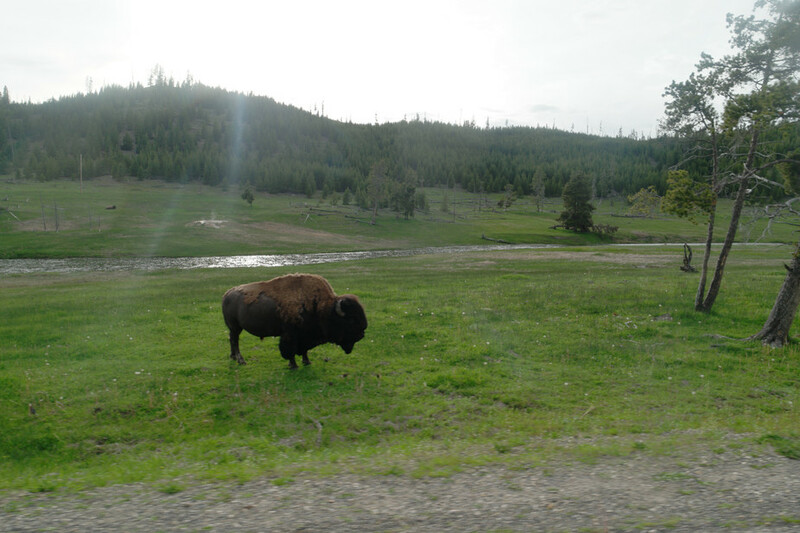 Visits to Yellowstone offer ample opportunities to see wildlife, and this is a major attraction of the park. This picture was taken safety from the car, and at least 25 feet away, as required by the NPS rules (the rule is 100 feet for bears and wolves). You can appreciate how freely the animals roam in the park in their natural habitat. In fact, the buffalo in Yellowstone are the oldest herd, continually inhabiting Yellowstone since prehistoric times (NPS, Bison, 2018). Bison were the most important animal to the Indians who lived here or came to the area to hunt, and relied on them for sustenance, so much so that according to NPS, the military strategy was to kill these animals to destroy the source of food, and thus destroy their culture. Thankfully, according to NPS, it was also the US Army, who ran the park in the early 20th century after poachers killed many animals, and helped bring back their herds and protect them for future generations. Yellowstone proves to be a very memorable vacation. The park encapsulates the splendor and majesty of US topography and natural landscape. There is something about seeing nature on this scale that awakens new things in the soul. You are reminded that nature is an awesome force to be reckoned with, but is also humankind's greatest ally and inspiration. Visiting Yellowstone in the Spring proves a captivating experience. Words fall short to explain its immense beauty. 7.Ensuring the legacy of National Parks for future generations by educating our kids. Yellowstone is not only beautiful and unique on a national scale, but it is a testimony to the importance of preservation on a global scale. By bringing our children and families to these parks, we are sharing in its beauty & mysteries with generations to come. Why? Because it is my hope that my children will go there with their children, and that the awesomeness of nature is never forgotten. We are the keepers of nature. If you travel because you want to discover new things, Yellowstone does not disappoint. It is this very spirit of discovery that served as the impetus to settled the West, and allowed the expansion of new ways of life. Traveling west allows a glimpse into the Native American history of our country, as you can fully appreciate the knowledge and wisdom required to control the amazing power of nature. Native Americans often visited the parks and understood the power of its mysteries. Seeing the West allows us to reflect on the balance between discovery and respect for different ways of life - we can see the practical uses of the private lands surrounding the park, used for ranches, and the public use of the park for appreciation and preservation. Seeing these two goals live in harmony with respect for different views, serves as an example of unity and a testament to our nation's ability to peacefully solve problems and balance the needs of different ways of life. 9. Visiting Nature is a way to ensure its conservation. Sharing pictures of Yellowstone with the world on social media and with friends and family helps spread its legacy and importance throughout the world. At a time when the world is at times forgetting the importance of ecological preservation, Yellowstone is a perfect example of how conserving our natural heritage is an importance piece of our nation's historical and cultural landscape. Nature is ours, and it can never be bought or sold. Hopefully, Yellowstone will be part of the inheritance we leave the world as Americans. 10.You might learn something new about yourself. Nature inspires us to look within. For my husband, who grew up the West, visiting Yellowstone was going back home and rediscovering a part of himself and showing his upbringing to our children. For me, Yellowstone inspires a love of photography and writing, as well as sharing these scared spaces with the world. I end this blog with a excerpt that describes why Yellowstone is a place to see this lifetime, and how it changed one man's life. Yellowstone was a surprise to me. As a man in my early 20s, after a childhood of steady moving (10 schools in 10 years), the last thing I expected to find was a sense of place. Like many young people whose parents moved frequently, my place was with my family. Sense of place was a cliché, and not only did I not expect to find such a thing in Yellowstone, I didn’t know I needed it. But apparently I did, for within days of my arrival I felt an attachment growing — a vague comfort with my surroundings. At the same time, growing coincident with this feeling of being home, I found a sense of wonder. 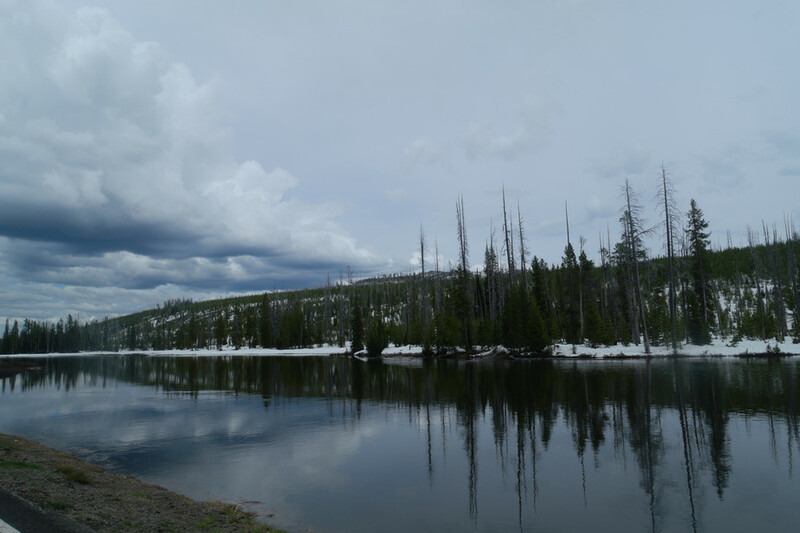 Yellowstone spoke to me, sang to me, of a wild, strong, unexperienced, and good life. My previous trips to the West, little more than hasty vacations, had given a hint of this. I’d known for years that the high West had something for me. I’d felt on those earlier trips an attraction, and was vaguely aware of a need to be in the West, but I could never have identified the cause; much less trace it to this joy of surroundings I now felt soaking into me. Not only was I home, I was in love. It seems that one barely has time to enjoy the discovery of a new love before the old fears creep in: Can it last? Will it go stale, or be lost to another? Love of wild country carries those risks. No sooner was I awakened to the joys than I began to learn the threats: the enormously complicated economic, social, political, and biological forces that constantly threaten Yellowstone. The thought of the chaotic flow of desires and motivations that compels millions of people to enjoy, use, and exploit Yellowstone gave me a sense of cause. I had come home, not only to a place, not only to a love, but to a responsibility. Yellowstone proves to be a very memorable vacation. The park encapsulates the splendor and majesty of US topography and natural landscape. There is something about visiting nature on this scale that awakens new things in the soul. You are reminded that nature is an awesome force to be reckoned with, but is also humankind's greatest ally and inspiration. Yellowstone is America: its wilderness, the history of its people, and its beauty - it is a testament to the future of this country.